Read The History But Bring Your Imagination. 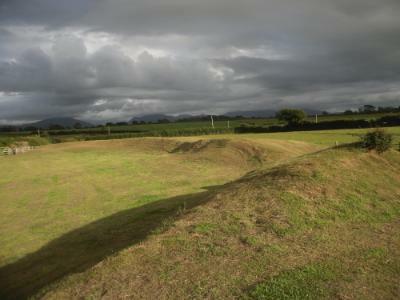 It is very likely that the sensuous, circular embankment of Castell Bryn Gwyn reaches back into that invisible period about 2,500BC. This is the Neolithic Period of Anglesey Man and Woman’s history. Archaeological discoveries and comparative structural investigations do offer a chronology. Yet, as I write above, this period over 4,500 years ago remains a theoretical/speculative treatise. It holds water. That tedious little paragraph aside, may I encourage you to visit Castell Bryngwyn near sunset, as the golden light casts engaging – and again – sensuous shadows. This is romantic rather than eerie. There again, I haven’t visited the site at twilight when shadows begin to move and dance. Push all such nonsense aside. It’s Free Admission. If you have young children, then it’s a fabulous place to roll down and laugh and enjoy a pop, cake and Soggy Sandwich Picnic. Take plenty of photographs and roll about a bit yourself. Remember to show a dignified respectfulness in your glee. Laughter and Silliness are Nature’s greatest cures for Melancholia. Unless someone’s absolutely determined to be bleedin’ miserable. Don’t invite them. Tell them you’re going to buy coal. Now more tedium. Ignore it if you want. That is, unless you want to tell your friend, partner or children a story and bring them closer. Embellish. Tell them about wild dusky maidens and muscular brutes. Quite clearly when you visit you will note that the Castell Bryngwyn site is essentially a circular structure though now incomplete. 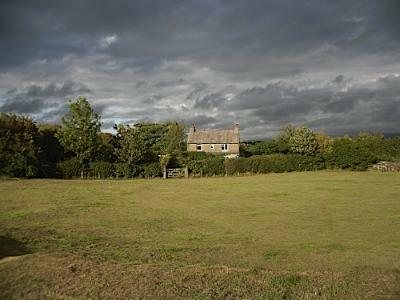 The mounds have been removed to allow the lovely little farmhouse to peer between the trees into the enclosure. The walls of gravel and clay stand at just over 2 metres at their highest point and the enclosure is in the region of 55 metres in diameter. Stone walls support and maintain the structure today, though these now appear an intrinsic part of the entire site. The site was first archaeologically studied in 1959 and 1950. A couple of names have been offered in translation of the Welsh ‘Bryngwyn’. By the way, Castell means Castle'. In its simplest translation Bryn-Gwyn means ‘White Hill’. But like most Welsh place names there is a significant local name, partly poetic in origin. 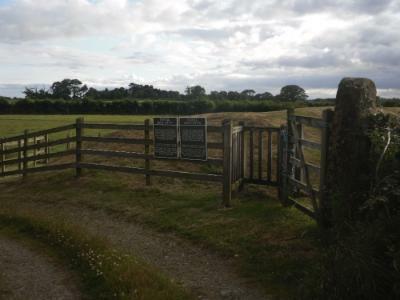 As I told you above, the real initial purpose of this site is unknown, but is thought by CADW to have been a religious sanctuary from the Neolithic Period. I prefer the translation, Blessed Hill, as its derivation can be regarded as a direct reference to its ancient religious aspect. None of the research I’ve done indicates evidence was discovered of sustained internal community structures existed. Had there been then they must surely have been of a temporary nature - Although stones are always a valuable agricultural commodity. All else is corrupted by Moth and Rust. 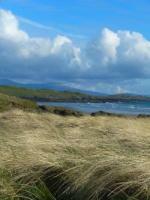 This is of course Anglesey, Home of the Mona Druids. Their true religious ceremonies are sadly forever hidden to us in Time’s vague shadows. 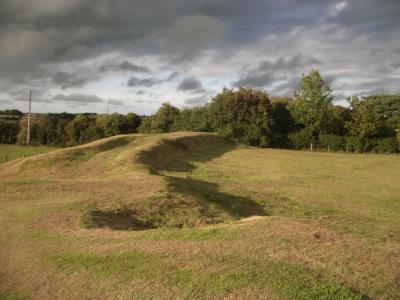 Some individuals have described Castell Bryngwyn as a hill fort. It is the nature of the site that draws the comparison. 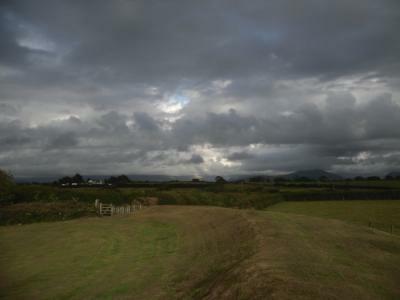 Quite clearly the flat agricultural land across the entire south west corner of Anglesey undermines any possibility of it ever being a hill fort. That it might have been a sanctuary would of course have demanded some form of fortification. That would account for the creation of the high earth and clay walls (‘Berms’, I think) to create a sense of sanctuary and safety. 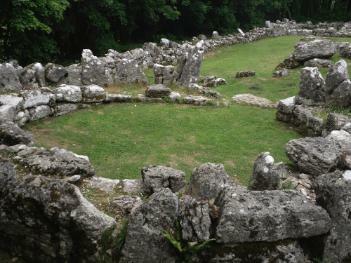 During the Neolithic Period it is proposed that this was a religious site – a Henge. The nearby presence of the significant Ancient Bryngwyn Stones should be considered as confirmation. 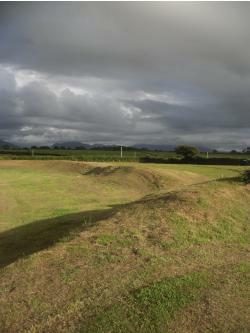 An embankment and a wide ditch date back to about 2500BC, although the ditch is no longer in view. 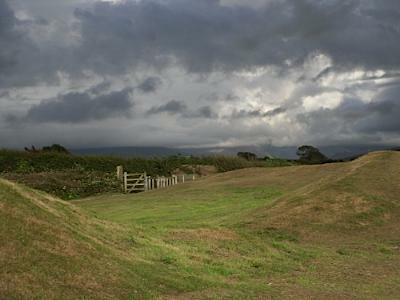 To create a workable image, compare the Castell Bryn Gwyn settlement to that at Din Lligwy near Moelfre. What is absent here are the remnants of any domestic residence. 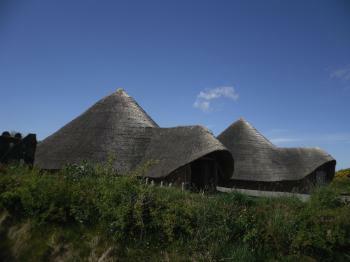 During the Iron Age those Din Lligwy structures are revealed as being circles or rectangles of rough hewn stone with wooden upper walls and straw roofs. No-one mentions this absence. So maybe one can speculate by the absence of structure that the site might have been temporary in use for most of its existence. An idea of < b> can be gleaned from the excellent Llynnon Mill Huts . These are a modern representation based on validated archaeological research and are mostly built from local materials. 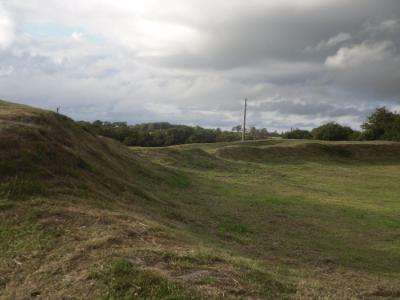 Artefacts such as Roman pottery and a coin have been found at this site. These date to the 1st Century BC and this date is not insignificant. This is about the same time as the Romans invaded Anglesey twice in order to subdue the Anglesey Druids who were supporting the Briton rebel cause. The first invasion nearly failed at its outset because our Anglesey women terrified the troops of Suetonius Paulinus. There were also tales of devilish practices on the Island. 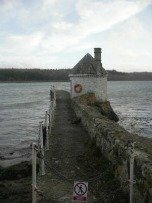 Click Here For More Anglesey Romans. Either, bring plenty of muscular company. Or, maybe pop to the farm that’s obvious on your left when you’ve just started down the track. I think it’s called Bryngwyn Bach. You could ask here about permission to drive down to the entrance. The main track leads down to another small farm. Maybe Farm A could have a word with Farm B. Unless, of course, there some generational feud going on. After all this is Anglesey and look at the example our County Councillors are setting. Faint heart ne’er won fair lady. I dare you to go and ask. You’ll be surprised how nice people really are and they really care to assist. 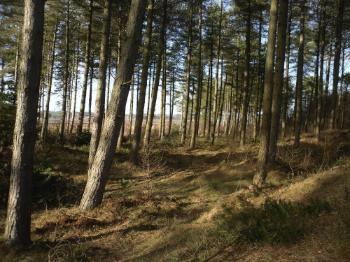 The good news is that CADW maintain this pleasant site close-cropped during the holiday period. 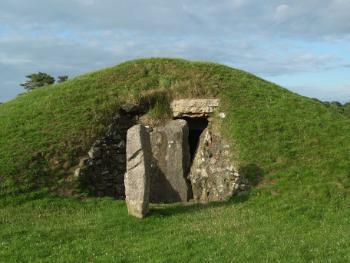 Caer Leb - A similar structure right on the southern outskirts of Brynsiencyn. The sign and turning are on your right immediately you leave the village. Just check out the Google Map I’ve placed below. The small parking place is just a few hundred yards on the opposite side of the road to the big white house on the left corner (coming from Brynsiencyn). 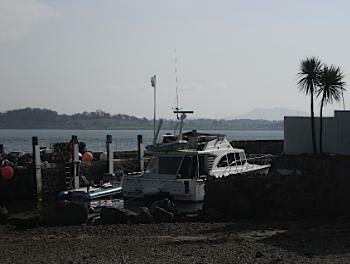 Return from Castell Bryngwyn to ANCIENT ANGLESEY.